조선 후기 충청도 지역 군현 지도들을 수록한 지도첩이다. 채색필사본이며, 영조~정조 연간에 제작된 것으로 추정된다. 제3책의 충청도 도지도(都地圖)와 제5책의 문의(文義) 지도 뒷면에 ‘비변사(備邊司)’라는 도장이 찍혀 있어, 비변에서 소장하며 사용하던 지도임을 알 수 있다. 지도책은 총 6책으로 구성되어 있으며, 2장의 충청도 전도(全圖)와 67장의 군현 지도가 수록되어 있다. 군현 지도는 1리 방안, 도별 지도는 10리 방안의 눈금 위에 그려져 있다. 한편, 제4책의 12장과 제6책의 16장 등 일부 지도는 방안지도가 아니라 전통적인 회화식 군현지도의 형식을 취하고 있다. 지도 여백의 주기(註記)에는 경도(京都)와의 거리, 민호(民戶), 남녀 인구수, 전답(田畓)의 면적, 세곡(稅穀), 군정(軍丁), 창고, 역참(驛站), 진도(津渡), 면리(面里) 등의 자세한 정보들이 기록되어 있다. 중앙정부에서 지방의 실정 파악을 위해 일괄적으로 제작한 비변사 지도로, 학술적 가치가 높다. 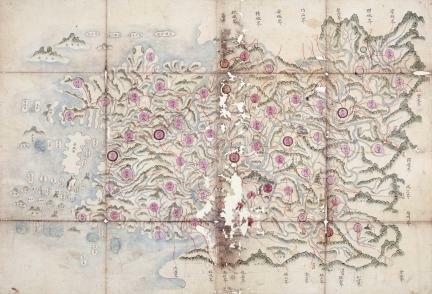 These six-volume album maps of the Hoseo Region, or Chungcheong-do Province, produced in the early 18th century, contain individual maps of 67 counties (gun and hyeon in Korean) in Chungcheong-do and two general maps of the province. The maps are hand-drawn and colored. The general provincial map in the third volume and the county map of Munui in the fifth volume have seals of the Border Defense Council on the back, indicating the maps were kept and used by the Joseon government agency basically responsible for security affairs in border areas. The county maps are drawn on grid sheets divided into sections of 1 ri square (1 ri approximately equals 400 meters), while the provincial map is on a grid sheet with 10-ri sections. The maps on the 12th page of the fourth volume and the 16th page of the sixth volume are not on grid sheets, but depicted in traditional painting technique. Each county map has an inscription along the upper edge, providing detailed information necessary for regional governance such as the number of households, the male and female population, farmland areas, amounts of exchange grain and grain levies, troop levies and corvee laborers, distance to the capital city, warehouses, post and horse stations, and ports and docks. The maps were produced to provide the central government with basic geographical information necessary for governance, and have high historical and academic value.